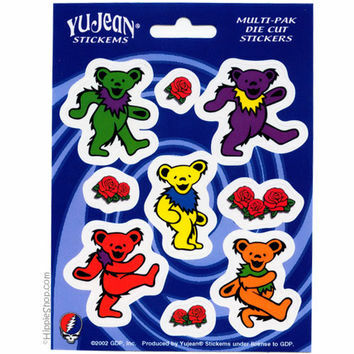 This multi-pack of die cut stickers features 5 different colored Grateful Dead dancing bears and 4 rose decals as well. Nothing says Grateful Dead quite like dancing bears and roses. Each bear is approximately 2" long, and the roses are approximately 1/2"-1" long. These are great for your iphone, tablet or laptop.